This interactive course is in movie format. This course is excellent for occupational and physical therapists, COTAs, and PTAs evaluating and treating lateral epicondylitis. Instructional methods include: Lecture, examination, and demonstrations. This course is an intermediate to advanced learning level. This course reviews bony landmarks, discusses causative factors, and ways to modify common tasks and treat lateral epicondylitis. Lateral Epicondylitis is one of the most common upper extremity tendonitis and the most lingering. This course will help the therapist gain control of this difficult diagnosis. Mixed level learning course - Instructional Methods include PowerPoint presentation, lecture, and video to enhance understanding. Upon successful completion of the examination (80%) your certificate will be sent via email. Review tips, tricks and techniques to help treat this challenging diagnosis. I did learn several new tricks to add to my bag as well as other clinical reasoning skills to enhance my decision making.
. 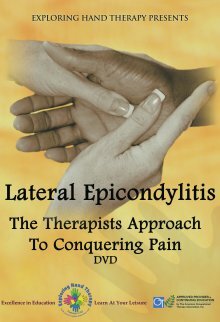 Very good information on Rx program for epicondylitis. I was able to implement the ideas in the course immediately and had very good response.